Symptoms of Septoria leaf spot (brown spot) Photo: University of Minnesota. Click on image to view a larger version. Brown spot is a common leaf disease caused by the fungus Septoria glycines. 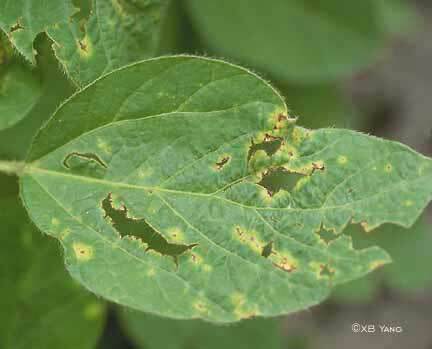 Like bacterial blight, brown spot occurs in most soybean fields every year, especially in years with plenty of rain. Septoria brown spot generally infects older leaves in the lower canopy. However, during a warm, rainy season, the disease may move up through the plant. Later in the growing season, infected leaves may turn rusty brown or yellow and drop prematurely. 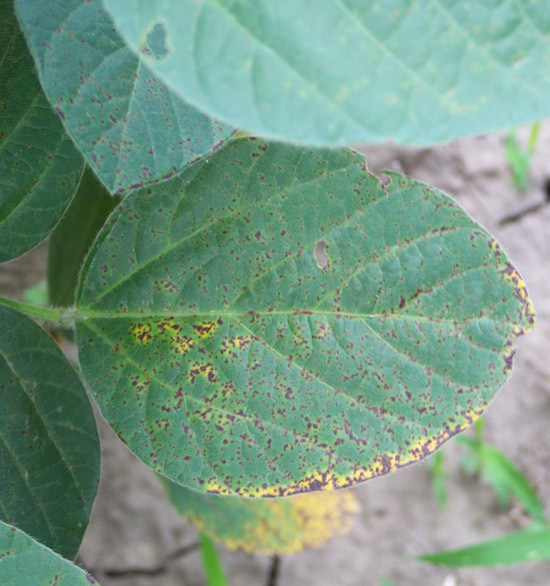 Brown spot normally does not affect plant growth, and soybeans can outgrow the disease in most years. The main effect of brown spot infection is premature defoliation of lower leaves. It is rarely reported to affect yield, but some yield loss may occur during very wet growing seasons. Septoria glycines overwinters on infected plant debris and occasionally on seed. 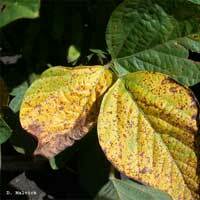 The pathogen spreads from the soil to lower soybean leaves by splashing rain. Epidemics can occur in seasons with frequent rainfall. The spread of the fungus stops during hot, dry weather. 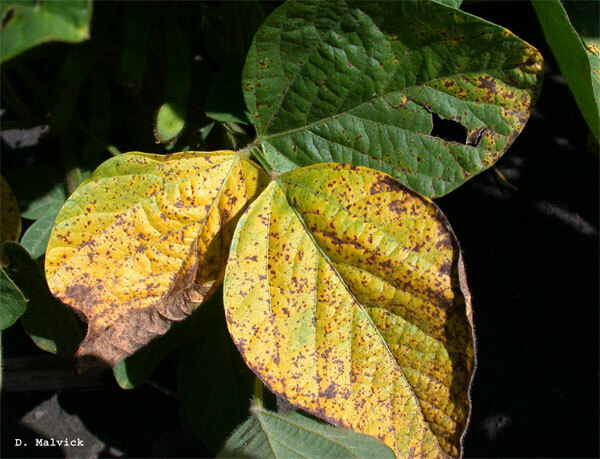 Because the brown spot pathogen infects aging leaves, soybeans weakened by other diseases or agronomic practices become more susceptible to this disease. 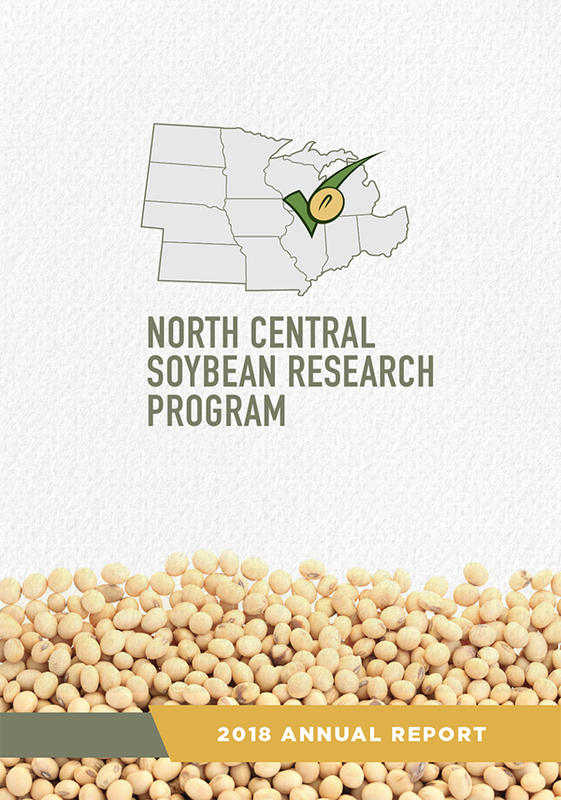 It has been observed that relatively high levels of brown spot occur in fields with severe soybean cyst nematode damage, Fusarium root rot, and other conditions. If you find abundant brown spot, check whether another primary cause is present, such as nematodes. Symptoms of Septoria leaf spot (brown spot). Photo: University of Illinois. Click on image to view a larger version. Symptoms of brown spot are many small, irregular, dark brown spots on both the upper and lower leaf surfaces. Adjacent spots (lesions) frequently merge to form irregularly shaped blotches and browning of the leaf edges or along the leaf vein. Infected leaves turn brown and yellow and may drop prematurely. Brown spot can be mistaken for bacterial blight. Both diseases often occur in the same fields and even the same plant, and symptoms can be diffilcult to separate. Rotate crops with nonhosts such as small grains or corn to allow time for soybean straw with fruiting bodies to degrade. 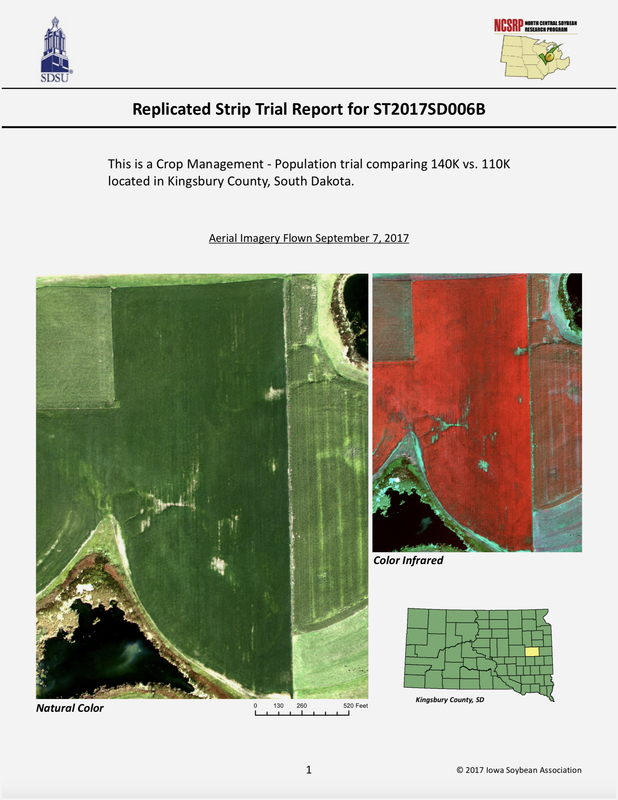 Manage residue, especially in fields with high levels of brown spot. Plow or shred soybean straw to promote rapid decay. Because brown spot is usually minor, fungicide treatment is generally not recommended. Each lesion caused by bacterial blight (above) will have a yellow halo, especially in the early stages. Compare to brown spot lesions, caused by the fungus Septoria. Photo: X.B. Yang, Iowa State University. Click on image to view a larger version. Brown spot lesions caused by Septoria develop a more generalized yellowing where brown spots are present. Photo: University of Illinois. Click on image to view a larger version.